These pages refer to the construction of my previous home cinema in our house in Birmingham. 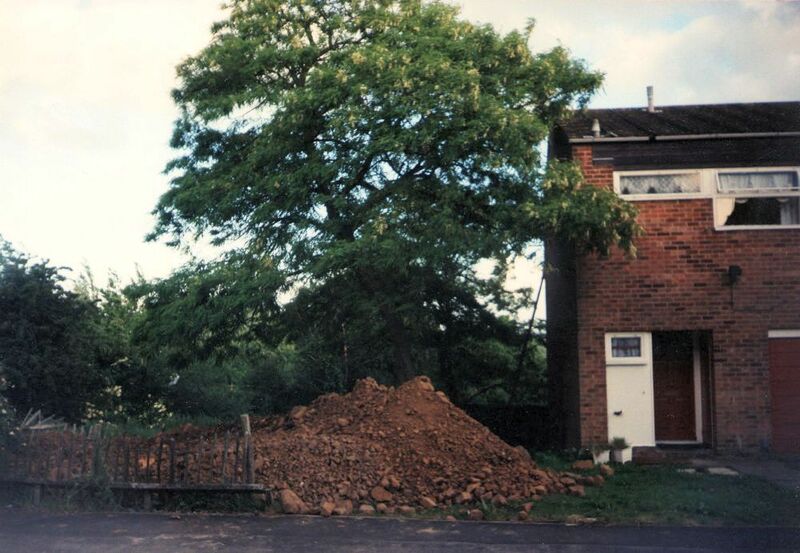 We sold this house September 2003 to move to Telford. My house is split level. At the front is the front door and garage. Beyond the garage is the living room. Upstairs are the bedrooms and bathroom. Downstairs is the kitchen and back door. It was clear to see that the 'space' under the garage was not being used. I asked around and the neighbours confirmed that in the 1970s when the council build the houses, they ran out of money and decided to fill this room with earth rather than develop it. I was told that some neighbours had discovered their rooms to be empty. 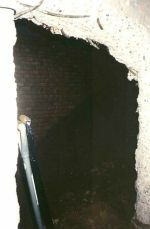 So in the summer of 1997, with the help of a friend in the construction industry, Gerry Byrne, I decided to drill through the hall wall into the room to see what was there. It was hard going. 9 inch reinforced concrete walls! My room, it seemed, was not empty. We calculated that if the room was full of subsoil, we'd have to excavate about 80 tons. When emptied, the room would be about 18 feet by 12 feet. 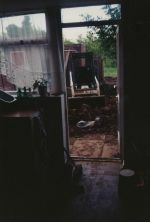 We decided to 'go for it' next summer and take the subsoil through the kitchen and out of the back door to the garden. It would then be removed from the back garden in one go. And so it started in the summer of 1998. The Red triangle over the plan of the bottom floor indicates the position and direction of the photo. 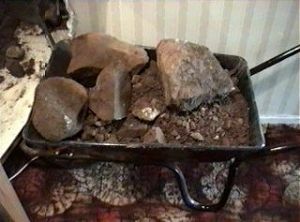 I used a pick, shovel and wheelbarrow to move the subsoil through my kitchen and out the back door into the garden. Needless to say the kitchen carpet tiles and garden both got totally trashed. I wasn't quite prepared for the amount of cement dust in the house when drilling through the wall. Everything in the house was covered in a layer of grey dust. Including every CD in the rack! 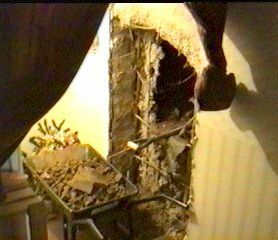 Here we are with most of the subsoil removed from the room. At this point, my garden was completely full of subsoil up to 6 feet high. Somewhere along the way I managed to catch my hand and leg against the sharp metal rods embedded in the concrete and so I have a couple of small but permanent scars to show for my carelessness. 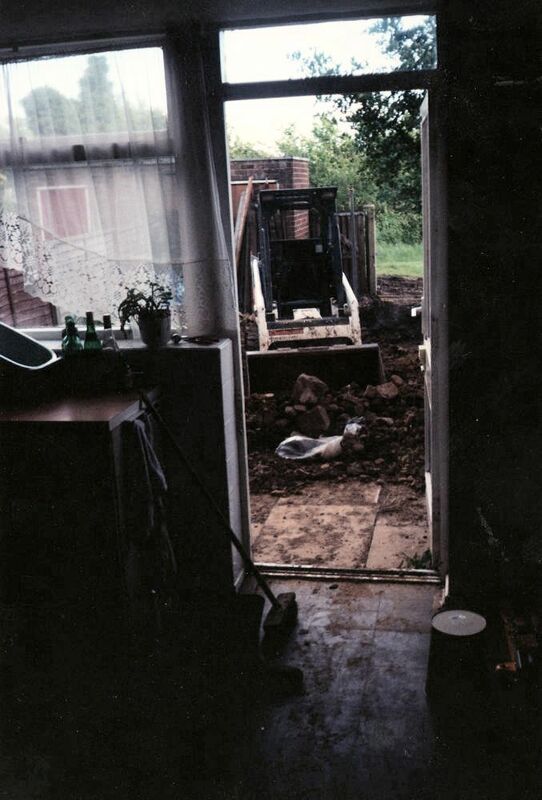 Once the room was nearly empty, I cut down the fence at the bottom of my garden and hired a bobcat to remove the rubble up the council path round the side of my neighbour's house (the end terrace) to my neighbour's front lawn, creating a mound 6 foot high. 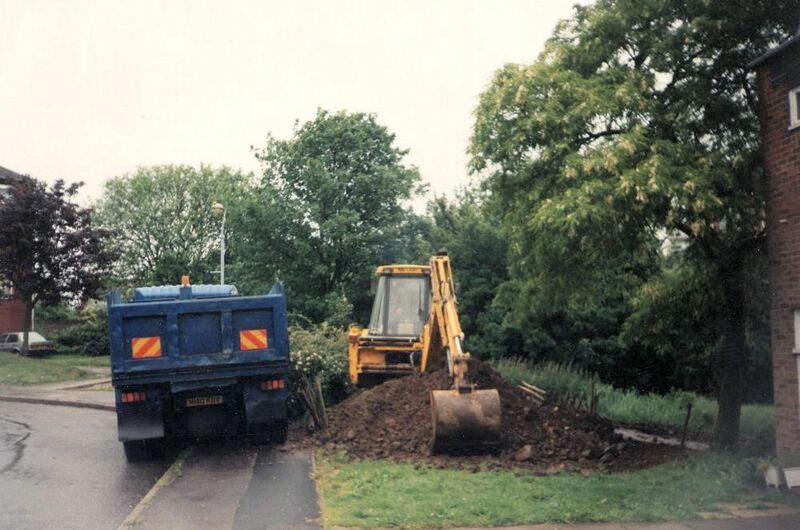 Unfortunately, despite the fact it was June (1998), it rained the whole time, and the path outside my back garden, the council path up to the front of the houses, my garden and the neighbours garden were all completely trashed. 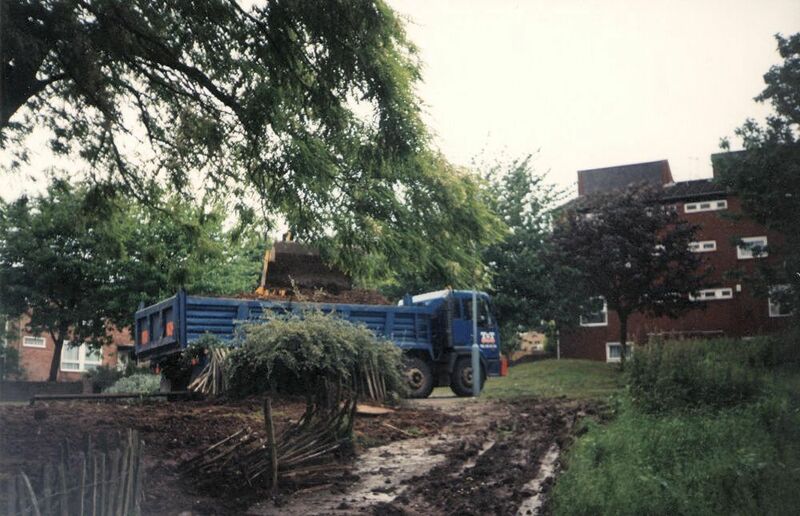 I think my neighbour began to regret letting me put the subsoil on her front lawn prior to removal by a JCB and 20 ton dumper trucks. This shot shows the top of the path leading from the back of my house up to the front. On the left is my neighbour's garden. Her fence, the path and the grass area to the right of it can be seen well destroyed. 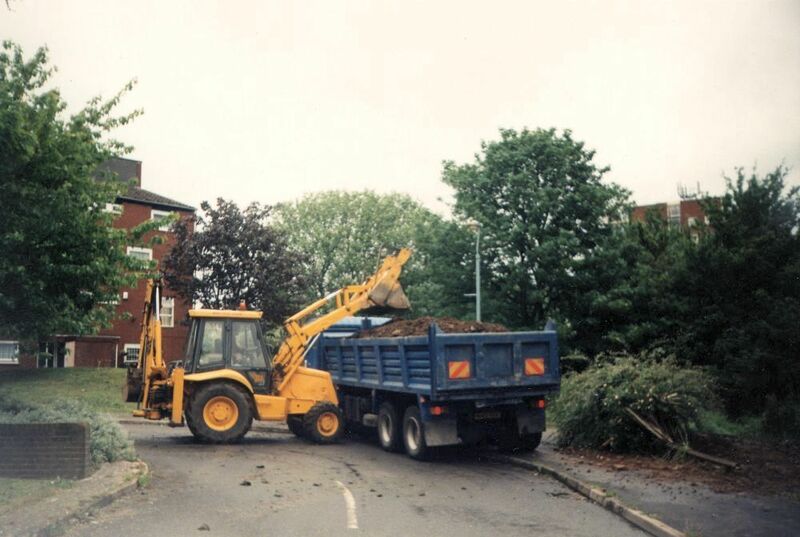 The rubble was finally removed with a JCB and 2 loads in large dumper trucks. They did the whole lot in minutes, and made it look easy. 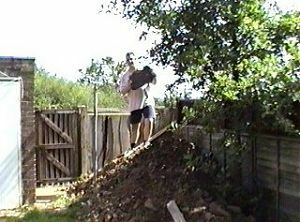 After the rubble had gone, the neighbours garden was a complete mess and had to be fixed up with new topsoil and plenty of grass seeds. I also had to pay for the council path to be repaired as several of the paving slabs were broken up.